After John Brown’s raid on Harpers Ferry, Virginia, in 1859, new militia companies were formed in the South. Businessman William W. McDowell, whose wife acquired this house from her father’s and brother’s estates, raised a company called the Buncombe Riflemen. After the war began in 1861, the unit entered Confederate service as Co. E, 1st North Carolina Infantry, under Col. Daniel H. Hill. 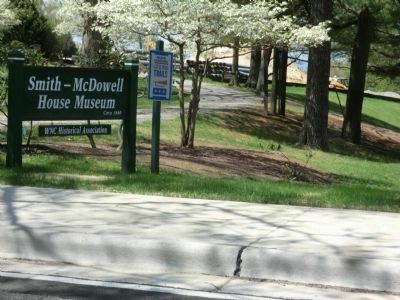 McDowell led his company during the first land engagement of the conflict in present-day Virginia, the Battle of Big Bethel, on June 10, 1861. The 1st North Carolina played a key role in repulsing the 5th New York Infantry’s attack on the Confederate left flank and was largely credited with the victory. of government bonds. After the war, he continued in business until ill health forced his retirement in 1870. One of McDowell’s slaves, George Avery, a 19-year-old blacksmith, enlisted with McDowell’s encouragement in the 40th United States Colored Troops in April 1865. The unit guarded railroads in East Tennessee and mustered out in February 1866. Avery returned to Buncombe County and became superintendent of the South Asheville Colored Cemetery, which was first used as McDowell slave cemetery. 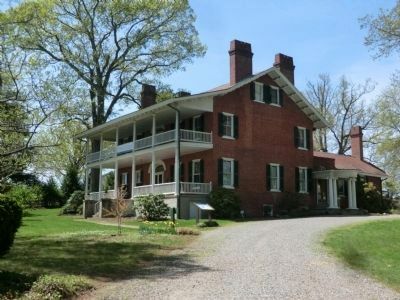 James McConnell Smith, an early entrepreneur and one of the wealthiest and most influential men in antebellum Asheville, constructed this Federal and Greek Revival-style dwelling about 1840. His daughter, Sarah Lucinda Smith, married William Wallace McDowell and acquired the house. It remained in the McDowell family until 1883. 35° 34.327′ N, 82° 33.302′ W. Marker is in Asheville, North Carolina, in Buncombe County. Marker can be reached from Victoria Road 0.1 miles south of Oakland Road, on the right when traveling south. Touch for map. Marker is at or near this postal address: 283 Victoria Road, Asheville NC 28801, United States of America. Touch for directions. Other nearby markers. At least 8 other markers are within 2 miles of this marker, measured as the crow flies. St. Genevieve ~ Of ~ The ~ Pines (approx. 0.3 miles away); Asheville Normal School (approx. half a mile away); Newton Academy (approx. half a mile away); Flood of 1916 (approx. 0.6 miles away); Biltmore House (approx. 0.7 miles away); The County of Buncombe (approx. 0.8 miles away); Rutherford Trace (approx. 0.9 miles away); Private George Avery (approx. 1.2 miles away). Touch for a list and map of all markers in Asheville. More. 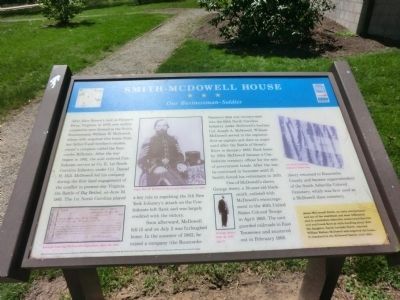 Search the internet for Smith-McDowell House. Credits. This page was last revised on June 16, 2016. This page originally submitted on July 20, 2014, by Don Morfe of Baltimore, Maryland. This page has been viewed 458 times since then and 11 times this year. Photos: 1, 2, 3. submitted on July 20, 2014, by Don Morfe of Baltimore, Maryland. • Bernard Fisher was the editor who published this page.